PLANNING is under way for the annual Chichester Priory 10k. It will be held on Sunday, February 8, with runners gathering in the Northgate car park next to the Chichester Festival Theatre ahead of a 10am start. Organisers are confident the race, now in its 24th year, will prove as popular as ever. It is the first major local running event of the year and gives athletes an early opportunity to assess their post-Christmas fitness, especially if they have a longer run in mind later in the year. Many runners use it as part of their marathon training for the London and Brighton marathons. The course for 2015 will be virtually the same as last year but the finish returns to its more traditional route through the grounds of the CFT. There’s an earlier start time of 10am to avoid any possible conflict between runners and traffic. The start will be in College Lane and runners will head north until they reach the junction with Wellington Road, where they will turn right into Graylingwell Park. Runners will notice a change in the character of the route through Graylingwell as the Linden Homes development continues. After running through the park, runners will arrive at the top of Kingsmead Avenue and after a gentle downhill slope will join the old course at 2k. From then on it is business as usual around the Goodwood airfield, into East Lavant and back down the Broyle Road to the finishing line in the car park. This well-established local race is popular with a wide range of abilities and entrants from all over the UK will take part. It is hoped many faithful supporters will return as well as new entrants so the race limit of 1,800 runners will be reached for the seventh year running. This race for the last few years has always been overscribed and at this early stage, entries are already as high as at the same time last year. If you intend to take part, make sure you get your entry in at the beginning of January at the latest. The race is organised by the Rotary Club of Chichester Priory who use it to raise considerable sums for many deserving causes. For 2015, for the first time for a number of years, one of the major sponsors is a new name, JB Architecture – a very well-respected firm of architects. The other major sponsor will, for the eighth year, be Brooks, the international sportswear company. The race has two support sponsors – estate agents Henry Adams and solicitors Wannops. 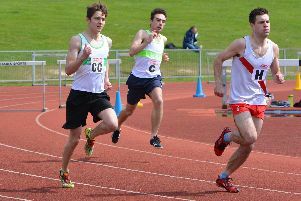 Many athletes who have competed in previous years are likely to be back hoping to be among the winners, beat the course record or achieve their personal bests. For some it will be a first run in Chichester; for others, a first run over this distance – but everyone is welcome to enter. All the local running clubs are expected to enter strong teams. The race is again part of the Harvey Curtiss road race challenge series so expect some of the best runners in Sussex to attend. It is also part of the Sussex Grand Prix series. In the men’s race, Phil Wylie from Bristol is likely to be back to defend his title and he will be joined by other top-ten finishers from 2014 – Paul Whittaker, Kevin Rojas and Neil Boniface. At present, the leading female entrant is Rebecca Moore from Worthing, who was fourth last year but more recently in October was bronze medallist at the England national ten-mile road championships held in conjunction with the Great South Run. The leading runners will be back at the Northgate car park in about 30 minutes, but for the next 45 minutes large groups of runners will be crossing the line. Full coverage before and after the race will once again be provided by the Observer. If you have been inspired by recent sporting events or want to be fit for a new challenge in 2015, now is the time to enter.